TOP > Projects > Youth Projects > Teens' Photo Project > [Teens' Photo Project] Movies for Young Adults: "MOVIE" = "BIBLE"
[Teens' Photo Project] Movies for Young Adults: "MOVIE" = "BIBLE"
I would like to introduce movies that most teenagers like. I watch lots of movies, especially during weekends. Watching movies is the best way to heal my heart and body. Now, I would like to share my favorite movies with you. 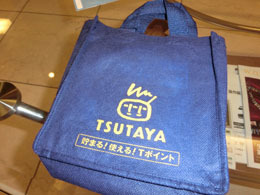 "TSUTAYA" is a bookstore, but is also a place where the new DVDs are sold and rented. On weekends I always go to TSUTAYA and rent two movies. People like me aren't unusual because many high school students like to rent DVDs. Last week, I borrowed a movie called "Valentine's Day." 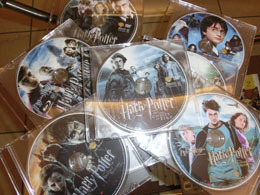 Harry Potter films are some of my favorite movies. I have been watching them since 2001, and I am a huge fan of Hogwarts. Harry Potter ended last year, 2011, but I still cannot believe that the series is not continuing. I still remember that my father bought me the Harry Potter books when I was 10 years old. I really enjoyed reading them, but I still love the movies the most because they are much easier to understand. These are my favorite movies. As you can see, most of the movies in the picture are about high school students. I like these movies because the stories are fantastic, lovely and funny. Especially, I like "WATER BOYS" the best. WATER BOYS is about high school boys trying hard at synchronized swimming to perform on their last culture festival. I like the scenes where the boys are practicing hard because I can feel their youth and energy. It makes me want to do cheerleading with my teammates. These are the movies that I saw during winter break. "RAPUNZEL" is the best Disney movie ever. I first thought that it would be a childish movie, but I was completely wrong. The story was very romantic and filled with beautiful art. I like the part where Rapunzel and her lover are riding on a boat and watching beautiful lanterns. Also, I liked "Letters from Juliet" as well. This story is filled with love, and it was based in Italy. After watching this movie, I really wanted to go to Italy, see Juliet's Castle and wait for my Romeo from the balcony. 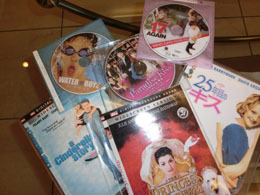 I could tell that I mostly love "Romantic Comedy," "Love Story and "Fantasy" movies. I think the majority of high-school girls mostly like girlish movies. Movies are my bible. I have learned many equations from my mathematics textbook, but I never felt such excitement. I have learned so many things, especially from movies. Movies always give me a hint for life when I get depressed. Watching movies is the best way to relax, so I recommend this if you are feeling stressed right now. Child Research Net would like to thank the Doshisha International Junior/Senior High School, Eri Nabeshima, student and author, for permitting reproduction of this article on the CRN web site.